SINGING WITH CETA - In honor of our Winter Olympians, we sang our National Anthem. Tremendous, inspiring . . .
HELLO SONG - Ben Gurule led us with great enthusiasm! 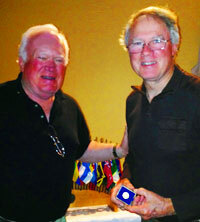 PAUL HARRIS AWARD - Dwight Perry presented Walt Schneider with his latest Paul Harris! TEXAS HOLD’EM POKER TOURNAMENT - TIME IS CLOSING IN . . . March 22 - Masonic Lodge - THIS IS OUR LARGEST FUNDRAISER AND FUNDS MANY OF OUR PROJECTS -Dinner and Tournament - WE NEED PRIZES AND PLAYERS $200 buy-in. Alan will be having poker lessons at his house by the world famous poker players: Alan West and Dwight Perry! Watch your email for the date! More info to follow! ROWELL RANCH RODEO PARADE Rowell Ranch Rodeo Parade - Theme “Castro Valley Rocks!” Co-Chair TL Baily confirmed that we WILL have the Wells Fargo Stagecoach this year! PROGRAM - Today Tony Shah, Director of Student Services for Castro Valley Unified School District, who has his undergraduate degree from California State University, Sacramento and his doctorate from the University of the Pacific in Educational Leadership, was our speaker, addressing a major issue in every school: Bullying. Bullying was brought to life by Dr. Shah as he shared from his personal and professional experience with stories of challenges, victories and how we much not let down in our efforts. • 1/4 students state they have been bullied, while 9/10 LGBT (Lesbian/Gay/Bisexual/Transgender) students have reported being bullied. take bullying very seiously and attack it vigorously, including training all faculty and staff how to identify it and take action immediately when it is witnessed or reported to them. It is important to remember that in addition to dealing with Bullying and other safety issues for Castro Valley students, the Student Services Department offers resources, support and information to enhance a student's experience at the Castro Valley Unified School District. They are concerned for the well-being and attendance of the students within CVUSD. The Student Services Department can assist families in connecting with school and community resources to address issues which may be affecting your students' attendance. The Student Services Department provides support in the following areas: Enrollment, Residency, Inter and Intra-District Transfers; School Attendance and Truancy; School Attendance Review Board (SARB); Drug, Alcohol, and Tobacco Programs; Character Education; Homeless Student Services; and Bullying Prevention. LOOKING FOR THE WHITE MARBLE - With $51 and 16 marbles, Bernie Kempen reached into the sack and won . . . $5!